Models for fitting spatio-temporal point processes should incorporate spatio-temporal inhomogeneity and allow for different types of interaction between points (clustering or regularity). This paper proposes an extension of the spatial multi-scale area-interaction model to a spatio-temporal framework. This model allows for interaction between points at different spatio-temporal scales and the inclusion of covariates. We fit the proposed model to varicella cases registered during 2013 in Valencia, Spain. The fitted model indicates small scale clustering and regularity for higher spatio-temporal scales. Iftimi, A, van Lieshout, M.N.M, & Montes, F. (2017). 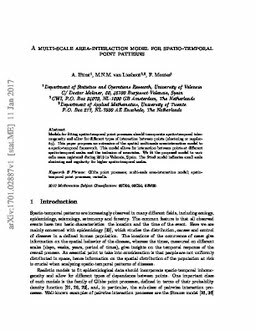 A multi-scale area-interaction model for spatio-temporal point patterns. arXiv.org e-Print archive.